This salad, along with the next two recipes (vanilla cheese pie & the dilly turkey melt) are on the menu for this week in our household. This is a nice, light, healthy salad that could either be had as a single meal or used as a side to accompany something else. Either way...it's yummy. And it's good for ya too! In a large bowl, combine the first five ingredients. In a small bowl, combine remaining ingredients. 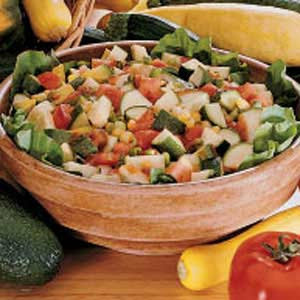 Pour over zucchini mixture; toss to coat. Cover and refrigerate for at least 4 hours. Yield: 8-10 servings. Keepin it light around here in the summer...a nice twist on a good old fashioned cheesecake. Preheat oven to 300°F. 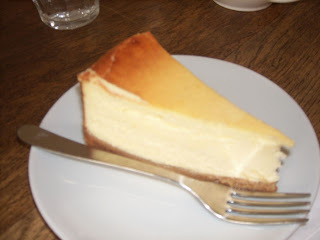 Beat cream cheese and sugar in large bowl with electric mixer on medium speed until creamy. Add eggs and vanilla; beat well. Pour into graham cracker crust. Bake 1 hour or until center is almost set. Refrigerate at least 3 hours or overnight. For the Topping, add vanilla to raspberries. Spoon over each slice of pie before serving. A fun little melt that is easy to make and really yummy. In a large skillet, saute onions in 1 tablespoon of butter until tender; remove and set aside. Spread barbecue sauce on four slices of bread. 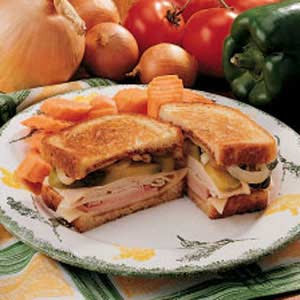 Layer each with one slice of cheese, bacon, turkey, pickles, onions and another slice of cheese. Cover with remaining slices of bread. In the same skillet over medium-low heat, melt remaining butter. Cook sandwiches on both sides until golden brown and cheese is melted (skillet may be covered the last few minutes to help melt cheese if necessary). Yield: 4 servings. Oh, people. It doesn't get any better than this. Best all-around comfort food ever. EVER. Try it. You'll love it. We do. Cook macaroni according to package directions. Meanwhile, melt 4 tablespoons butter in a large saucepan. Stir in flour until smooth. Gradually add milk. Bring to a boil; cook and stir for 2 minutes. Reduce heat; add cheeses, mustard, salt and pepper. Stir until cheese is melted and sauce is smooth. Drain macaroni; add to the cheese sauce and stir to coat. Transfer to a greased shallow 3-qt. baking dish. Melt the remaining butter; toss with bread crumbs and parsley. Sprinkle over macaroni. Bake, uncovered, at 400° for 15-20 minutes or until golden brown. Yield: 6-8 servings. This was the main course tonight and it was delish! 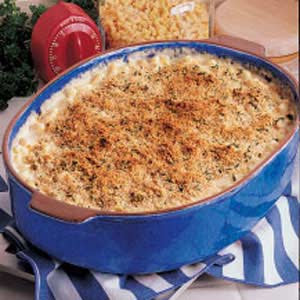 This recipe came from kraftfoods.com. Mix cheese, garlic powder and salad dressing mix. 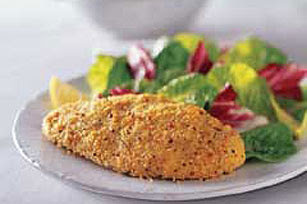 Moisten chicken with water, coat with cheese mixture. Place in shallow baking dish. Bake at 400 degrees for 45 minutes or until chicken is cooked through. Makes 6 servings. My mom got this recipe from my cousin, Shannon, and she made it as a side dish to accompany our dinner tonight. AWESOME. And that's why I'm sharing it all with you. Spread beans on bottom of 9 x 13 pan, then layer corn on top. Separately mix cheese, onion, sour cream, and soup. Spread over vegetables. Combine butter and crackers and sprinkle on top. Bake at 400 degrees until brown (we did 30 minutes).